Let us examine the most recent of such cases, the one involving the Minister of Aviation, with respect to the purchase for her use of 2 armoured BMWs by one of the agencies under her supervision. What are the facts as we now know them? The approved budget for the purchase of 25 vehicles by the ministry in the 2013 appropriation act is N240M; 10 Toyota Hilux Pick Ups, 10 Toyota Corollas, 5 Toyota Land cruisers, 5 Toyota Hilux Pick Ups, 3 Toyota Hiace Buses, and 2 Security Inspection vehicles. The Minister on her on, and as far as we now know, went ahead to unilaterally approve N643M instead of the N240M approved by the NASS, and signed into law by the President, in the 2013 appropriation Act, for the purchase of 54, and not the 25 operational vehicles approved for the ministry. Furthermore the agency, NCAA, then went ahead to purchase the 2 armoured BMWs for the use of the Minister, at a cost of N255M from this pool of N643M approved by the Minister. We now know from the HoR committee on Aviation, the legislative oversight committee for the ministry, that the purchase of the 2 armoured BMWs was in the budget proposal submitted to the NASS, and which was rejected and not approved in enacting the 2013 Appropriation Act. We also now know the BPE contrary to the claims by the NCAA was not involved, nor was it in the know of the tendering process for the purchase of these vehicles. Now, there are a number of issues involved in this case, quite a number of criminal breaches and gross violations of a validly made law of the Federation involved in this case! For starters, in authorising a budget of N643M for the purchase of 54 vehicles, instead of the approved N240M for the purchase of 25 vehicles with recourse to the NASS, the Minister breached the 2013 Appropriation Act; And if she granted approval without the knowledge and or authorisation of the Federal Executive Council [FEC] , and the President; then this is also a gross act of insubordination and undermining of the authority of the office of the President, in addition to the institution of the National Assembly [NASS]. Secondly the N255M expended in the purchase of the 2 armoured BMWs is already N15M more than the amount legitimately appropriated for the purchase of 25 operational vehicles for the Ministry at N240M. If these are the only two vehicles that have been bought, then it means that in order to satisfy the Minister’s needs, the nation through the NCAA and the supervising Ministry, would have lost the opportunity for the purchase of 25 operational vehicles this financial year. In other words, the minister’s interest was a priority over the interest of the country. If the remaining 52 vehicles have been bought or are in the process of being bought, then there are quite a number of issues to be raised? Where and how did the ministry get the additional N403M over and above the approved N240M in the 2013 appropriation Act? Next it is important to point out that whereas N255M was used in the purchase of only two vehicles for the Minister’s use; N388M was or would be expended in the purchase of 52 operational vehicles! In other words, the minister’s two vehicles alone is more than the combined cost for 25 operational vehicles! How cost effective is such a decision? Was the minister lacking official limousines? Is it the responsibility of the Ministry or of the FEC to purchase vehicles for Ministerial use? Do different ministers of the same government use different makes and or brands and specifications of official vehicles? Whose responsibility is it to decide, approve the type and specifications, purchase and ensure the maintenance of official vehicles for members of the President’s cabinet? These are the questions begging to be answered, and they are the issues involved in this ODUAGATE that once again affirm not only the sleaze and rottenness going on in high places, but also the culture of impunity that underlies and drives the official, remorseless, and rapaciously ferocious looting of the treasury that has been going on, and whose intensity has increased tremendously in recent years. So when anyone comes to you to say after all it is only N15M or N403M difference; point out to the person that the opportunity cost of that is at least 25 to 52 operational vehicles for the ministry; the completion of a perimeter fence at some airport, the completion of the renovation of one airport etc; not to speak of the impunity involved in the flagrant breach of a valid law, and the gross undermining of the authority of the President of the Federal Republic that is involved here! 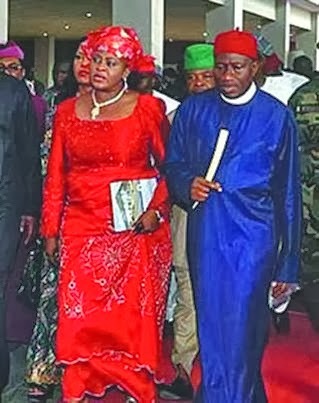 And when they make excuses about Oduah not being the first or only one involved in impunity; then let us respond by emphasizing the fact that although it may be convenient for thieves and treasury looters to justify their pillage by claiming that they are stealing on behalf of their respective ethnic and or religious groups and sects; in reality, ordinary citizens from their ethnic groups and religious sects benefit nothing, and are in fact short-changed by their unconscionable and inhuman looting spree! How many rural roads, fully equipped and fully staffed community hospitals can be built with the N255M expended on 2 armoured BMWs? How many Public Primary and Secondary schools, can be built, fully equipped, fully staffed, and or completely renovated with the N403M additional funds that the Minister unilaterally appropriated for the purchase of additional unapproved vehicles? Impunity is impunity, and it is the bane of our collective underdevelopment and we should neither ethnicise it nor justify it on the basis of religious or political affiliation. It is important to state that it is an insult to our collective sensibilities and our collective common sense to allow executive law breakers, abusers of office, and treasury looters to attempt to get away with criminality on the flimsy excuse that they are not the first or only one involved, and that what is involved is a small amount of money compared with others! If we do not take a firm stance to reject corruption and abuse of office whenever it is exposed, then we would be laying the foundation to justify the political elite’s ‘turn by turn’ approach to treasury looting; and we would be helping them to steal in our name, on our behalf, and to our detriment. Enough Is Enough! It is Time To Take Back Nigeria! It is up to us to take collective action to take our destiny into our own hands, and rid ourselves of the death grip and chokehold of these swarms of locusts and Vagabonds In Power!